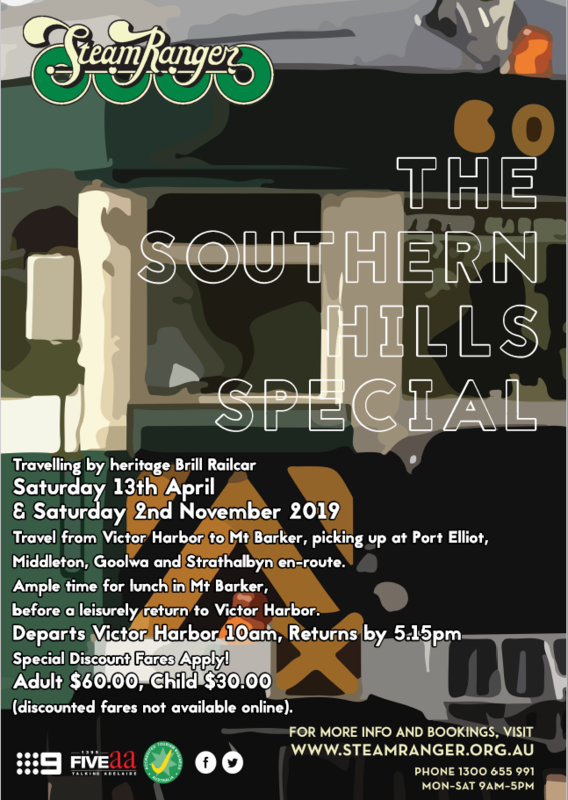 The Southern Hills Special provides a day’s journey from Victor Harbor, travelling the famous Cockle Train route along the picturesque Fleurieu Coast to the heritage river port of Goolwa. Departing Goolwa the journey continues over the most historic section of the 82km of railway track, including bridges,small rail sidings, natural scrublands and rich farmlands to Strathalbyn. A 20-minute stop at Strathalbyn allows time to stretch the legs and briefly visit some of the local venues of this interesting country town. The journey then winds its way over the southern slopes of the Mt Lofty Ranges to the destination of Mt Barker (including Mt Barker Workshops — the ‘home’ of the SteamRanger Heritage Railway). Spend some leisurely time visiting the myriad of shops and eateries – or, alternatively, enjoy a mid-day meal in the restaurant at the historic 1800s Auchendarroch House. On the return journey, relax and relive the history of part of the 120-year-old line from Adelaide that once upon a time served the farming communities of the southern Mt Lofty Ranges and the seaside holiday resorts of the Fleurieu Peninsula. Passengers are welcome to travel as far as Strathalbyn, enjoy a meal at a local eatery, and perhaps partake in a little antiquing before catching the return train back to Goolwa or Victor Harbor.